Sunglasses at School, or S@S, is a not for profit Health & Fundraising Initiative that promotes education and awareness of the effects that UV exposure has on the eyes of children. 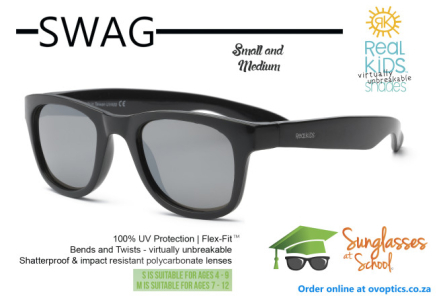 S@S makes the best quality children’s sunglasses available to children in the school environment, in order to protect them when they need it most and to raise funds to protect the vision in South Africa’s at risk children’s future. S@S implements The Initiative in schools by providing educational materials, informative talks and regular screenings to member schools. Children are exceptionally at risk of UV damage to eyes – 80% of your lifetime UV exposure happens before age 18, and it is this exposure that causes discomfort and irritation to children, and a wide variety of ailments that may impair vision in mid- and later-life. S@S makes virtually unbreakable children’s sunglasses available to schools and clubs, with or without their own branding. 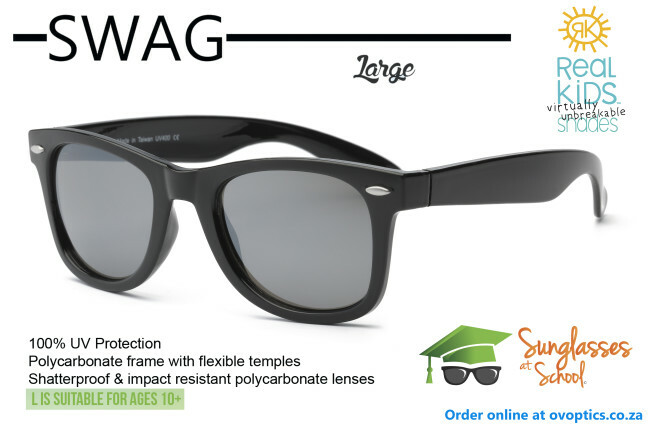 The Real Kids Shades S@S range is bendable and twistable, black in colour to suit every school kit and made from non-toxic materials with shatterproof polycarbonate lenses. All RKS sunglasses are third-party tested to provide 100% UVA/UVB protection as measured by the strictest American, European, and Australian governing bodies. 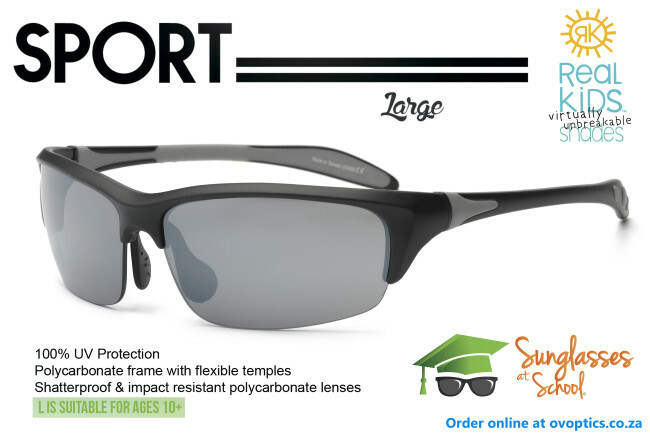 The S@S range consists of 2 styles, Sport and Swag, available in 3 sizes suitable for 3 to 18 year olds. 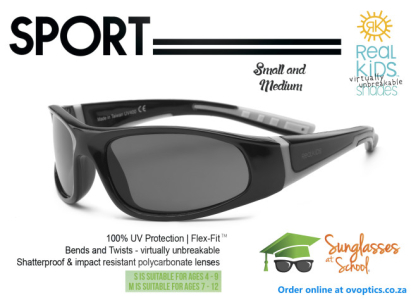 Real Kids Shades are CPSIA Compliant, CE Certified, Rx Capable and approved by The Melanoma International Foundation and PreventBlindness.org. S@S sources School Sunglasses from Real Kids Shades South Africa, or RKS_ZA, and offers to member schools for optional inclusion in their sports kit and uniform packs – for every pair a school buys, a second pair is donated to an identified child in need of extra protection in rural, disadvantaged or dire financial situation that have undergone ophthalmic surgery, requires more protection due to albinism, various other medical reasons or participates in organised sport as a regular practice. A member school may also nominate a No Fee, Section 21 school in need that they would like to assist with vision screening and optical assistance. A Buy 1 Give 1 Movement of sorts. Funds raised from the sale of school sunglasses to member schools are used to create more awareness, reach more schools, and so create employment, donate more sunglasses to those in need and also supply scripted photochromic lenses to those children whose parents cannot afford it, so they can see clearly and be protected at the same time. Eligible recipients are identified through optometrists and ophthalmologists that serve governmental clinics, teachers who notice vision issues in the classroom, community organisations that focus on children and members of the public who nominate children in need. The Sunglasses at School Range – a perfect fit for every school uniform.